To achieve the goal of empowering young people and communities in low- and middle-income countries, ensuring that they can access high quality sexual and reproductive health and rights, eradicating poverty and achieving the Sustainable Development Goals, means convincing decision-makers at all levels that this is the right course of action. That is why we are working hard every day at local, national and international levels, to advance this agenda. DSW’s primary advocacy activities take place in Germany’s capital, where we maintain constant exchange with political decision-makers. 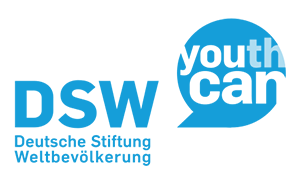 As part of this work, DSW supports the work of the All Party Parliamentary Group on Population and Development (APPG) – an important forum to initiate support for global health for German Parliamentarians. With and through the members of the APPG, we continue to push forward the debate on development assistance, global health and ensuring that important issues such as promoting sexual and reproductive health and rights, continue to remain visible and relevant for policy-makers in Germany. Our Brussels office allows us to work with the European Commission, European Parliament and EU member states to encourage greater European Union support for development and global health. This has included: fighting for more funding for health and global health innovation, defending the EU’s commitment to SRHR in global development from attack, and making sure that the EU takes seriously its role as a promoter of gender equality and women and girls empowerment. DSW’s Executive Director, Renate Baehr, is a member of the High-Level Task Force for the International Conference on Population and Development (ICPD). The Task Force was established to provide a bold, progressive voice for advancing sexual and reproductive health and rights for all, and to advance gender equality and the human rights of women and girls, and the rights and participation of young people. Through Renate’s membership of the Task Force, and through DSW’s participation in UN fora such as the Commission on the Status of Women and the Commission on Population and Development, we work to make sure that SRHR is central to international development discussions. An important part of DSW’s in-country project work is creating a sustainable future for youth-focused health services. We work to achieve this my making sure that politicians and decision-makers know the value of investing in health, and honour their funding commitments. Over past few years, DSW has successfully contributed to twenty health and family planning budget increases – amounting to 72.8 million USD – and 58 policy changes towards family planning. Together with its advocacy partners, DSW has helped ensure that family planning is included in the agendas of the EU, as well as in the low- and middle-income countries where we work. Our work in advocating for sexual and reproductive health and rights (SRHR), youth empowerment, and global health means that we are heavily invested in the international processes and dialogues that are ongoing. WE have seen the staggering progress that has been made as part of the Millennium Development Goals towards eradicating poverty and improving the lives of millions of people around the world. DSW is committed to locking in that progress and making sure we accelerate towards a world without poverty, and we work with and through important global processes and forums to achieve this. Countdown 2015 – DSW is a consortium partner of Countdown 2015 Europe, a consortium of 15 leading European non-governmental organizations working to ensure sexual and reproductive health and rights in developing countries. ICPD High-Level Task Force – DSW’s Executive Director, Renate Baehr, is a member of the High-Level Task Force for the International Conference on Population and Development (ICPD). The Task Force was established to provide a bold, progressive voice for advancing sexual and reproductive health and rights for all, and to advance gender equality and the human rights of women and girls, and the rights and participation of young people. European Week of Action for Girls – DSW is a core member of the European Week of Action for Girls organising group. The Week is an annual week-long event which aims to ensure that girls’ empowerment is promoted and their rights are protected and fulfilled in the EU’s external action, through adequate policies, funding and programs. G7 advocacy – Germany held the Presidency of the G7 in 2015, and throughout the year DSW worked closely with partners to make sure that the German government and its partners committed to health as a core part of the international agenda. In particular, we pushed for increased funding for Gavi, the vaccine alliance, and for strong language on the fight against diseases of poverty. EACH Coalition – The European Advocacy Coalition for Global Health R&D (EACH), an informal group of organisations with interest and expertise in advocacy for research for global health has come together to address the imbalance in funding for global health innovations.